For many animals at the Humane Society of Macomb Animal Shelter, they are not only in need of a new home, but relief from medical conditions they arrive with. 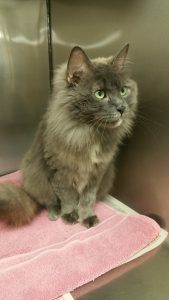 Sophie, a 4-year-old Domestic Longhair, was surrendered to the shelter, as her previous owner had too many animals in the home to take care of. As does every other cat that enters the shelter, Sophie was tested for Feline Leukemia Virus and Feline Immunodeficiency Virus. Each of these illnesses is contagious only to cats. Sophie tested negative for the viruses, and on physical exam appeared healthy. The employees that cared for Sophie later noticed that she had very bloody urine, and they alerted the on-site doctor. A urine sample was collected and tested, and it showed increased white blood cells and red blood cells. The increased cells can indicate a urinary tract infection, so the doctor placed Sophie on antibiotics. As there are other causes of bloody urine, the doctor ordered an x-ray of Sophie’s abdomen, to be taken in the Humane Society of Macomb Animal Clinic. The x-ray showed a bladder stone, which is a common cause of bloody urine. Bladder stones are made of substances normally found in urine. Several minerals combine to form crystals in the urine, which can be normal in feline urine. However, when the number of crystals increases to levels higher than normal, they can bind together, causing stones to form. Bladder stones can be very painful, and can sometimes even impede the flow of urine. In some cases, depending on the type of stone, special diets can cause the stone to dissolve through changes in the urine pH. Stones can also be removed through surgical procedures, which is what was opted for by the doctor caring for Sophie. The procedure is called a cystotomy, and involves making an incision into the bladder and removing the stone. Sophie’s stone was removed during a surgery in the clinic, and an x-ray confirmed there were no remaining stones in her bladder. Sophie did well through the procedure, and was kept in the clinic for observation while she recovered from surgery. The doctor sent the stone to a laboratory for identification, to determine how best to prevent stones from returning. Sophie will need to be on a special diet for the rest of her life, to prevent excess crystals from developing, and help to avoid stone formation. Sophie is currently available for adoption at the shelter. While Sophie will need special care, she is sure to make a wonderful companion for the person who adopts her. Sophie is one more example of The Humane Society of Macomb Animal Shelter’s dedication to providing the best care possible for its shelter animals. There are several special needs animals at the shelter that are looking for the perfect home, and the companion who can give them the wonderful life they deserve!